The 2018 E! 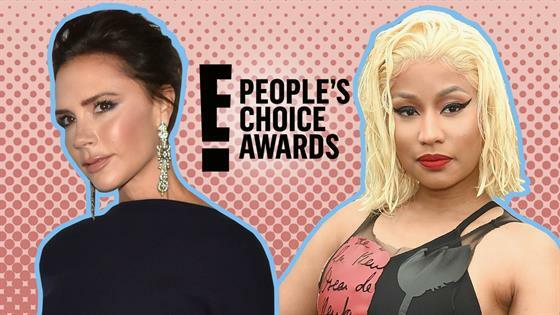 People's Choice Awards is making its inaugural debut on E! this Sunday, 11.11 AKA Nov. 11, 2018, and we've got all the details about this year's show. The four hour event will kick off with two hours of E! 's Live from the Red Carpet: The E! People's Choice Awards followed by the two hour award show. On Monday, E! announced that the show will include three special performances. Nicki Minaj will open this year's PCAs, followed by Rita Ora and later John Legend, who will also be presenting Bryan Stevenson, founder of the Equal Justice Initiative, with the People's Champion Award. Two other major awards will be presented to Melissa McCarthy who will receive with the People's Icon Award and Victoria Beckham who will be presented with the Fashion Icon Award. The 2018 PCAs will feature 43 total categories in total, which breaks down to awards in 16 television categories, 10 movie categories, nine music categories and eight pop culture categories. 10 of the finalists were actually write-ins by fans! K-Pop Bands Super Junior and BTS were handpicked by fans as well as Katherine McNamara and Harry Shum Junior who were written into the Female TV Star and Male TV Star categories. For a total breakdown of everything from the 13 new categories included in this year's show to the newly designed 12 inch tall E! PCAs trophy, take a look at the E! People's Choice Awards by the numbers video above.